It’s been a while since we’ve done a round up of some of the latest videos we’ve spotted, so here’s a few to watch on this chilly Sunday night. First up is Nimmo and the Gauntletts new single Change. The video was directed by Agyness Deyn, more well known for being in front of the camera than behind it. Agyness played the track on 6Music, and the band tweeted her asking her to appear their next video. She went one better and directed the video for them! Then we have The Beautiful Word, who’ve just headed out on tour. 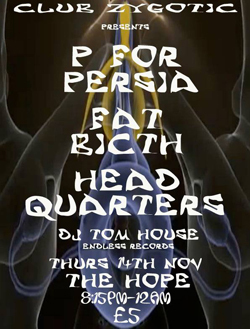 They’re playing Brighton on Thursday night at The Hope. This is the animated video for their track May Not Be Love, which will be on their album Particles which is coming out later this year. Here’s the video for Debbie Does Drugs by The Bobby McGees. This is one of the tracks from their upcoming album Je Vien Rechcher Mes, and is an opportunity to see Jimmy McGee without his trademark beard! Finally, here’s a video from the Nordic Giants gig at the Pavilion Theatre last month. This is Glass Skinned Girl, which is the b-side to the band’s new single Speed The Crow’s nest. 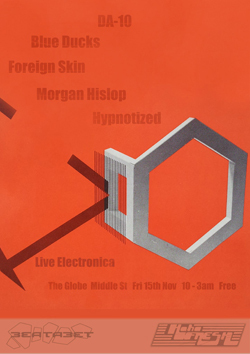 Nordic Giants are playing up in London next month, and there’s still one or two tickets for the early show (which you can buy here). Normally our weekly post about which gigs we think you should go to to see some of our favourite local acts starts on a Thursday. Thursday has long replaced Friday as the start of the weekend in the Brighton Music Blog calendar. This week though, we’re starting things even earlier on Wednesday, because there’s two cracking gigs on tonight which we feel deserve a bit of a mention. 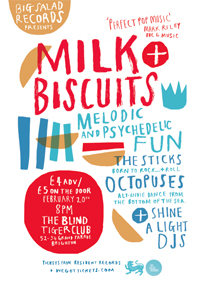 Tonight Milk & Biscuits play at the Blind Tiger. We loved last year’s epic White Noise single, and this is a great chance to see them playing their new material for their follow up to 2011’s Balcony Time’s mini-LP. Over at the Green Door Store, Danger De Mort are holding their third event. Their first night had Nordic Giants headlining, and we were gutted to miss last month’s event which had IYES and Us Baby Bear Bones supporting. This month’s local support are Curxes, who have promised to play the new tracks they they’ll be releasing later this year. I don’t know a great deal about the rest of the bill, headlined by a band called Cymbals, but we reckon it’ll be great just on the strength of their previous line ups. Onto Thursday night, where we normally kick off our weekend. One Inch Badge are putting Doldrums at the Prince Albert. Doldrums are from Toronto, but the supports – Us Baby Bear Bones and Luo are two of our favourite local bands. On Friday night we’ve spotted four gigs we like the look of. 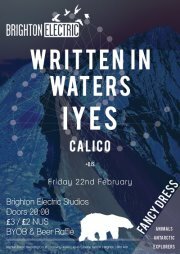 Written in Waters, IYES and Calico are playing at Brighton Electric, Speak Galactic and Cloud are supporting Antibang at the Prince Albert, Catherine Ireton is supporting Stu Larsen at Sticky Mike’s and Anneka is playing at live set at the Traumfrau night at the Haunt. We’re spoiled for choice! 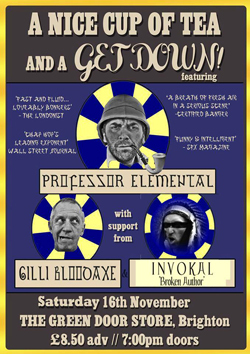 Then on Saturday Professor Elemental is launching his new single at the Marlborough. The single’s called This is My Horse (Show Me Yours), and we’ll be writing a separate post about it sometime next week.